We've been looking at the work of The Wooster Group in terms of hybrid performance here at Goldsmiths, so I thought I'd post my review of Cry, Trojans! that the Group performed in Singapore a couple of years ago. (Bearing in mind that I was a younger reviewer then, and was still figuring out voice, form, content and readership in criticism... In retrospect, there were some good points here, but clumsily conveyed. So many redundant adjectives, ugh.) This review was first published in The Straits Times. Stupefyingly dull, offensive, and an insult to Shakespeare? Or a work that pulls the rug out from under every sacred convention of theatre? Cry, Trojans! (which I might subtitle Cry, Unsuspecting Audiences!) is all of these things and more, a 2½-hour determined trudge through the minefield of Troilus & Cressida, one of the Bard's most problematic plays. Ostensibly about the doomed love story between the title characters from Troy, who pledge their love and then are ripped apart in two consecutive sets of betrayals (one political, one personal), the play is framed within a larger tale of betrayal of the Trojans by the Greeks, shunting aside the "protagonists" and initial bursts of ribald humour for a darkly violent, gloomy glimpse at war. The Wooster Group shocked their American audiences with what seemed to be "redface", the blatant cultural appropriation of Native American history; the Trojans are styled as a fictional tribe, feathers and all, dressed in grungy traditional dress that, at first glance, might have been pulled off the rack from a used costume store, yet is morbidly striking – some of the warriors sheath themselves in busts of Greek statues, worn on their backs like scalped human trophies. At the production's premiere in Stratford-upon-Avon, the Group horrified, even revolted, World Shakespeare Festival audiences, who derided the ensemble for poor acting and delivery and an utter disregard for text, and demanded "good theatre technique" and some sort of coherence. Many said they were connoisseurs of experimental theatre, but disdained this baffling experiment taking place in the heart of Shakespeare's hometown. It is on this polarising final production that the six-week Singapore International Festival of Arts closes with a startling bang. I myself emerged from theatre in slight delirium, with a bit of a tension headache and a churning stomach – but mostly from the prospect of looking at this production, piece by piece. The work does not necessarily reward the patient. It is a demanding, challenging production, sometimes tedious and sometimes difficult to follow, and riddled with problems – the most basic of which involves having an all-white cast replicate, to the point of slapstick, Native American customs and culture. It is a dramatic device practically prostrating itself for controversy and criticism, and yet I found myself inexplicably tugged along by the silent undercurrents of this conceptual melting pot: Will the conqueror ever fully understand what oppression means to the conquered? The Wooster Group is unabashed about this futility – no, we will never come to terms with the blood we have shed on Native American soil, and all we have left is a sort of play-acting within which we forcibly confine ourselves. The cast denigrates themselves, almost self-flagellatingly, before the stereotype of the Native American. Director Elizabeth LeCompte has stated that the starting point for this work was Shakespearean English as a second language for many American performers; layered over that beginning are interruptions of historical baggage, technological innovation, and the Group's deliberate and fiercely single-minded pursuit of a perfection that only its ensemble seems privy to, every movement and declaration carefully calibrated to fit a larger and mysterious blueprint. The School of the Arts Studio Theatre has been reshaped into a sort of version of the Group's Performing Garage in New York City, and its mostly bare stage is surrounded by television screens, with two DJs off to the side doing a live sound mix. It quickly becomes clear that the cast are miming gestures from other films and video excerpts being played on these screens, whether in some sort of barren Inuit landscape, or the high melodrama of the likes of Elizabeth Taylor and Warren Beatty in glamorous Old Hollywood. But which is which? Are the videos a simulacrum for the action on stage? Or are the gestures that are copied universal ones, to be read across circumstance and context? Some earn a chilling edge, when the glitz of leading Hollywood ladies flirting with their men is transposed onto the shocking delivery of Cressida into lecherous enemy hands. Others, when female cast members suddenly erupt into song, feel like a lazy gimmick. But when these moments work, they gain a stark resonance: all that will be performed has already been performed, and history, in the same way, will mimic what has gone before. Troilus and Cressida use the same gestures of violence on each other as the Trojans do in their pow-wow over what to do with Helen: Return their prized princess to the Greeks and end the war? Or stubbornly keep her and their honour at the risk of bloodshed? They trade blows, they convulse, they tuck their hair behind their ears. LeCompte shears off several scenes from the Greek camp, which mostly expound on the relationships between the Greeks, and focuses instead on the inner turmoil of the Trojan camp. The Greeks were initially played by members of London's Royal Shakespeare Company to maximise a clash of performance styles, but the work has continued to evolve since its premiere in 2012. Now, The Wooster Group takes on all the parts, donning masks when they play the Greeks, with a doubling of parts that turns enemies into friends and heroes into villains. The same actor who plays the lovelorn Troilus (Scott Shepherd) also plays the cruel Achilles; he also plays Cressida's scheming father Calchas, who brokers her trade with the Greeks. These multilayered characters seem to be a microcosm for the production itself. So much is at play in every scene: a deconstruction of the idea of acting, the repetition of movement across genres and art forms, the bursts of live, dubsteppy music, the echoes of recordings of previous iterations of the same production, a Mobius strip folding onto itself. Conceptually, Cry, Trojans! is fascinating – but also the equivalent of painstakingly pulling apart a complicated metronome. Its inner parts may be gloriously and endlessly fascinating, but it always trots out the same rhythm. It is almost as if the Group has created the machinery of a universe all to themselves, and I could not help but feel like a sidelined observer, only able to chip away at the surface of an automaton, its cogs and gears a-whirr. I puzzled over the actors' deliberate dispassion in delivering their lines, but was sucked in by the conscientiousness with which they sought to convey this devil-may-care attitude. One thing is for sure – this is Shakespeare as you have never seen it, and might never see again, in a tide of ceaseless contradictions. Photo by me. Before I was 'liberated'. I'd like to preface this response to I AM LGB by suggesting that you not read this until after you've experienced the experiment. Or to only read it if you're now wishing you bought tickets but it's too late and the show's ended its run. It was next to impossible to tell what audience members – or should I say participants – could expect from I AM LGB. The artists behind the experiment refused to give individual interviews to the media (or even to Singapore International Festival of Arts official blogger Ng Yi-Sheng) and would only agree to be interviewed as the fictional collective of the Lan Gen Bah Society Of The Mind (LGBSM) or the fictional artist Lan Gen Bah (LGB). All I knew was that the show was four hours long, running from 7pm to 11pm, at 72-13, coupled with a some slight mental preparation given my familiarity with the work of Ray Langenbach, Loo Zihan and Bani Haykal, and their penchants for documentation, archiving, re-enactments, and dissecting that fine line between performance and performativity in everyday life. The subsequent experience, which I'll try to summarise before digesting and processing it, was both incredibly frustrating but fascinating, a deep and hard look at individual freedoms, freedom of expression, groupthink, herd mentality, conformity and non-conformity, game-playing psychology and game design, all set against the looming backdrop of Singapore's own tumultuous history with performance art. I loved it. After signing a form agreeing to allow ourselves to be documented on video etc, my sister and I are escorted into a cloak room where we get a lab coat, a number, and a bright, Mao-red textbook with a pencil. We're immediately complicit in the performance in some way, since we're all wearing costumes and carrying props, adopting a prescribed identity, if you will. Along with other bewildered and curious audience members, we're funnelled into the main playing area after having our photographs taken and pasted on a wall. Other lab-coated audience members are already there, either sitting down on rows of white chairs or playing what looks like a simple ball game. I'm coaxed into playing as well – you're supposed to throw a ball back and forth with increasing levels of complexity (clap your hands before catching the ball, lift one leg, etc) while being mindful of the ball, and not worrying about failure. None of which happens, of course; we are all embarrassed when we drop the ball, apologetic, shy. - We can 'set ourselves free' or 'liberate' ourselves at any time. The catch being – you can't come back into the playing area. Also, no one really knows what happens after someone gets 'liberated' or 'liberates' themselves. And, Zihan emphasises, everyone will be 'liberated' by the end of the experiment, save one person, who will be anointed the new LGB for tonight. So we'll all be set free at some point. My coat comes with a green tag, so I'm in the 'green' group facilitated by Bani Haykal (or in this case, Weng), in a bright green coat and followed around by two black-clad assistants. The 20-plus of us are first instructed to do a kindergarten-type object sorting exercise. We're told to sort a pile of about 100 objects, but we're not told how or what categories they are to be sorted by. Some people, apparently already irritated with the infantilisation that's been happening since the start, have started to liberate themselves. The rest of us dutifully sort and re-sort objects, depending on the vague instructions given. Then we're told that two of our group members must liberate themselves, or we'll each have to justify to the group why we should not be liberated and made to liberate two people through voting. Two people quickly volunteer themselves as tribute in this bizarre subversion of The Hunger Games. Their photographs are struck out with a bright red marker. We're then subjected to a long lecture about the origins of the artist Lan Gen Bah, her work, and her intelligentsia parents' relationship with Mao Zedong. The bell rings, and it's a common test. A common test? I panic. I'm going to liberated, I think, because I wasn't paying attention to the lecture. The common test has one logic question, one algebra question, and three random questions that really could have any answer, completely irrelevant to the lecture before. The final question can't even be marked, because it depends on group responses. Okay then. Fifteen minutes later, we peer mark this test paper. I get nine points, the girl next to me gets six. I feel a perverse, repugnant sense of pleasure, that awful Singaporean competitive spirit in me, that I'm above average in this game. We're all made to stand up, and sit down into safety as the marks are called, with a highest possible mark of 12. Nine is pretty safe. Everyone with a three? or four? and below is escorted out. I shake my internal fist at the sky – how can this be! Art is meant to be all-embracing! You don't need to be good at math! There's 'recess', during which more people liberate themselves, and then Stage One: Hybridization. Every single group goes on a different trajectory now. Our group, which has dwindled significantly to about a dozen people, is led into a tiny, dark, confined room at the back of the playing area. Bani closes the door. We're all standing, shoulder to shoulder, as our eyes adjust to the darkness. "You'll be in here for 50 minutes," he says, so anyone who's claustrophobic should leave now. Two people leave. "50 minutes?" I ask, "not 15?" "50, five zero," he says. We all titter nervously. So we are in there for 50 minutes. First an excerpt of P. Ramlee's Labu dan Labi is screened on the ceiling, and we all have to lie down to watch it comfortably. Then we're given another audio lecture by a raspy, heavy breather, against a soundscape of water and industrial noises, about Cold War cultural diplomacy. Then we're made to have a discussion, within that hot, stuffy, confined space, about individual freedoms and freedom of expression. I feel as though I've regressed 10 years and am trying to out-perform or out-pretend freshman/first-year students at any given seminar in a liberal arts university. Another person leaves. At this point, about 40 minutes into our 50-minute slot, a live video feed of what is happening outside this room, in the large, spacious, air-conditioned playing area, is projected on the ceiling. When we finally step out, I feel as though my internal compass is whirling. I bend over to get over a sudden burst of vertigo. If I take off my lab coat – because I'm so hot – am I breaking the rules? Will I be liberated? "Liberation is a wonderful thing," intones one of Bani's assistants, piously. Bani/Weng, carrying an image of Haresh Sharma. It's 10pm by this point, and I'm exhausted. But no, there are more stations yet: Essentialisation, Enculturation and Totalisation. We have a discussion about the letter of complaint sent by Ray Langenbach's students to the National Institute of Education in the wake of the 1994 crackdown on performance art in Singapore, and we list down what we think should be taught in schools, and what shouldn't. It's a very meaningful and heartfelt discussion, but at the end of it, another four people are liberated through drawing lots. We're then instructed to pick an object from before and use it as an object lesson to explain why we are all 'collectively dreaming'. I don't understand what we're required to do – and I'm guessing neither does anyone – but we do it anyway, make up some embarrassing, ridiculous, jargon-filled speech ("light brings clarity, clarity brings communality") about these trivial objects (matches, playdough, a sponge, etc). We have been collectively dreaming after all, because each inane dream speech has influenced the next. In the end, about 90% of us remaining audience members are forcibly liberated, and only four people, who chose the most popular object (the sponge), remain. We're ferried to an upstairs room where most of the liberated audience members (about 50 of the 80 who came tonight) are talking, laughing and commiserating, framed by a breath-taking exhibition of what must have been hundreds of documents – whether from Langenbach's time at university or during the controversy surrounding 5th Passage and its performances at Parkway Parade in 1994. Hardly anyone is paying attention to the final four, who are making speeches off the cuff as to why they should be made LGB for the night. The voting is a farce. We vote at random, having not paid attention to anything. Someone 'wins' – but really, he's not winning anything, because everyone's going home. I hear myself asking someone: "Is it over? Can we leave?" Are we allowed to leave? 'LGB' for August 18 was Tim Nga. I AM LGB's tagline is 'between solitude and solidarity', and it's a skin-flaying experiment where the audience is pitted against itself. Just as the boundary between Lan Gen Bah and Langenbach's identity begins to blur, so do our own identities as audience members – it grows increasingly difficult to distinguish between our agency as an audience and being co-opted into this experiment. The paradox at the heart of this experiment is the promise that one can be liberated at any time, and do so voluntarily, but eventually realise that one can also be expelled through completely arbitrary means. This hinges on two fears: the fear of elimination, but also the fear that one cannot, as an audience members, 'finish' watching the show if one chooses to leave. This assumes some social contract between the artist and the audience, that by watching or participating in a production, we will gain some sort of entertainment or enlightenment by the 'end' through engaging with the artistic material. Do we game the system, or play the game? Does the machinery always win, since it boots you out if you decide not to be complicit? Does the machinery always co-opt you, since by staying you must decide to be complicit? I took this to be analogous to any system we perceive ourselves to be in; in my case, I immediately mapped these circumstances to my experience of Singapore and the Singapore education system. By functioning within a system, are you subject to it, and can you ever transcend it without being co-opted into a sort of blind collective judgment/decision-making? Most audience members existed on a continuum, I think. There were those who immediately allergic to what they perceived as a structure of utter BS and left; on the other end, there were those who engaged enthusiastically with the game in the hopes of an eventual narrative payout; and there were those like myself, in the middle, trapped and frustrated in a mode of self-reflexivity and undecided if they should participate, observe, or leave. From the first ball game to the final voting at the end, we're never really ourselves; we've relaxed into more comfortable, larger rhythms of groupthink and collective patterns. My sister, who went on a completely different journey, was subjected to a 'dance class' where participants had to interpret, through movement, a list of various dance genres. This began innocently enough, with 'ballet' and 'cha cha'. But what happens when it's 'Tibetan Bell Dance', or 'Amazonian Leaf Dance', or 'Dance 5.2678'? She quickly observed that the participants eventually began mimicking each other, regardless of how 'original' they perceived their movement lexicon to be. Resisting participation, she closed her eyes when she danced so she would be able to retain some shred of individuality and not bow to subconscious peer pressure. But even though she resisted participating, she felt genuine sadness when fellow participants chose to, or were made to leave. There are hints of a larger history connected to this experiment, with the students' letter to the university, the acknowledgement of 5th Passage and the names of various prominent performance art figures and the nature of their work communicated through the various interactive stations, of being confined in an "Iron Room", to choose between a painless death, where you move straight from sleep into oblivion, or a painful one, where you fight your mortality even though it is futile – much like the fight that artists, activists and advocates undertake in Singapore every day, the tango with censorship and bureaucracy that must be danced. The experiment we are in is a surreal, bizarre microcosm, a metaphor for what we experience day to day. Who makes decisions to include one group and exclude another? How do you decide to speak up for a cause or to abandon it? How far can collectivism prolong your tolerance for psychological trauma (be it a dark room or a common test)? I left, clutching my Little Red Textbook, with the sense that what was a complex, challenging and confronting social experiment was also a lesson; an object lesson about the process of education, miseducation, and re-education. We're first introduced to what it feels like to be part of a large, safe group, and immediately after, how it feels to go solo. Freedom and fear conflate and combine. Every interaction primes you for another moment of independent decision-making but also undercuts or subverts your expectations, the process of which moulds you into a form of perplexed cooperation. You realise that even as the rules matter less and less, you are striving, more and more, to submit to rules you have set for yourself. The facilitators initially appear to be impartial, at an arm's length, in their passing down of information and instruction. But our poor interpretations of this formal 'education' and what is required of us creates a hive mind of miseducation – where we look to those around us, going through the same experience, for validation. And I think it is only when we shed our costumes and retreat offstage, a marker for the end of a performance, that we can return to ourselves – not who we were performing as in this experiment - and finally evaluate what we have learnt. Yi-Sheng had me write an immediate response, post-I AM LGB, for his "Everyone's A Critic" series. I watched Wild Rice's Hotel for the second time over the weekend, and spent the next two days wondering what to write about it. You may have read my delighted review of it here, where I gave it five stars; you may also have read Ng Yi-Sheng's excellent thematic/literary analysis of it last year, or his more recent (and equally excellent) take on its political significance. For this year's edition of Hotel, I bought tickets – the moment they went on sale – for most of my immediate family, and convinced another two good friends to come along (one of them brought her brother). Last year, I'd watched Hotel utterly alone, wearing my "Straits Times Critic" hat, spending my 4.5 hours laughing and crying solo; this year, I spent an entire week prior to the show assaulted by insomnia because I was simply too excited about what would now be a communal experience. Hotel premiered at the Singapore International Festival of Arts last year over a single weekend. It fit perfectly into the festival's Post-Empires theme, a sprawling, ambitious production that takes place over 100 years in a single hotel room in Singapore, marking the time with one scene per decade from 1915 to 2015. From colonialism to the Japanese occupation to the country's economic boom to the present day, Hotel's guests range from plantation owners to amahs to Japanese soldiers to famed auteur P. Ramlee to Bugis Street trans folk to an entire wedding party – the list goes on. It was a staggering, astonishing achievement with uniformly excellent performance from its tireless cast (speaking a multitude of languages), turning the tables on the 'official' narrative of Singapore's birth and rise as a nation, fleshing it out with characters so convincing I'm assured they existed in some form or another and whose descendants we are today. And I think the reason for my sleeplessness and excitement was because I was so desperate to share this history with others. We've been marked so often as "cultural orphans", as immigrants who have discarded our "native cultures" for a shallower faux hybridity, for a "one-size-fits-all" attempt at multiculturalism that sands away complexity instead of encouraging diversity. Hotel mourns what we have lost, but celebrates what we've held on to and ponders what we may yet become. And theatre, like history, flourishes where there are a spectrum of views. Some of the best theatre experiences I've had were enriched by fierce, excited debate after, where friends and colleagues pointed out moments and shared insights that I'd missed from my narrow vantage point. Hotel, I'd argue, does the same for Singapore history. Who does history belong to? Which side of the story you tell depends on where you're standing when you look back. And how you respond to history depends on the baggage you bring with you. In-between Parts 1 & 2, and after the show concluded, my friends, family and I dissected each scene and pored over connections we interpreted and reinterpreted; some scenes (particularly 2005 and 2015) resonated much more strongly with me this year, a year of police brutality, deeply heightened Islamophobia, and jagged fault lines between "the immigrant" and "the native". Hotel has proved to be as fresh and relevant in SG51 as it was in SG50, because it trumps everything with its SG100. With its longer arc of history, in which history then repeats itself, Hotel reminds us that we cannot take the myopic, short-term view of our past. 4.5 hours, as does 100 years, sounds dreadfully long. But I assure you that Hotel, and history itself, will sprint and pass you by – before you even realise it. Ivan Heng, Lee Chee Keng and Lina Yu replace Lim Kay Siu and Neo Swee Lin in several roles for this year's edition, with Julie Wee and Pam Oei (from the original cast) chipping in with some reshuffling of the roles. I loved Ivan's caustic Henry Yao from 2015, an acid-tongued old man reflecting on his final days; Chee Keng did well as a gruff general from 1945; and Lina's bubbly Keiko-san, also from 1945, was very endearing. I'm going to go ahead and cite every single cast member, because they were absolutely stunning: Jo Kukathas, Ghafir Akbar, Brendon Fernandez, Moo Siew Keh, Dwayne Lau, Yap Yi Kai, Sharda Harrison, Siti Khalijah Zainal, Ben Cutler. Of course, direction by Ivan Heng and Glen Goei, script by Alfian Sa'at and Marcia Vanderstraaten. You floored me last year, you floored me again this year. I went home that night and had the most wonderful, deep sleep. 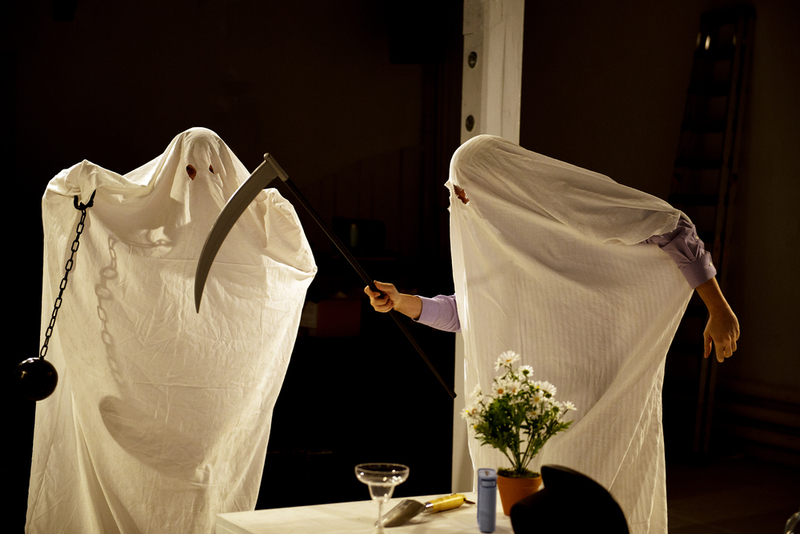 Ibsen: Ghosts by Markus&Markus at The O.P.E.N. I spoke with two friends (separately) after Ghosts last night, and we had two very different (and very intense) discussions about the work. German theatre collective Markus&Markus, using Henrik Ibsen's Ghosts (1881-1882) as a loose framework, had created a theatrical response to assisted suicide that was, at the same time, a biography of the late 81-year-old Margot, a warm, funny, confiding woman who chose to die on her own terms in 2014. One of my friends appreciated the production a great deal, noting the meticulous attention to detail – Markus&Markus were careful to keep Margot the focus of their documentary film footage (she's always in the centre of the frame, everyone and everything else is peripheral), they never allowed audience members to wallow in the swelling strains of Dvorak's sentimental "New World" symphony (a soundtrack to many of the scenes), and interspersed challenging, emotional moments with other scenes of bizarre humour (the Grim Reaper makes an appearance and gives a PowerPoint presentation on a type of pentobarbital used in euthanasia; Markus&Markus dress up in sheets and dance to the theme of Ghostbusters). My friend was glad that Margot had the final say on what they could film of her and what she ruled out as private. Sure, the show was irreverent, even decidedly vulgar at turns, but always respectful of its portrayal of Margot. Everything felt careful and deliberate. Another friend disagreed. How could they say that Margot "directed" the work? she argued. Markus&Markus did all the cuts. They had the final say. They represented Margot according to their own terms, not hers. She was further upset by Markus&Markus' decision to have a man with dementia be the protagonist of their upcoming (similarly documentary-type) work, Peer Gynt. How can someone who is not lucid give consent to be represented? she asked. Margot may have given full consent, but the discussion of dementia soured her initial acceptance of the ethics of their art-making. I, too, had strong and conflicting reactions to Ghosts. There were very few dry eyes in the audience. I've rarely seen death on stage so confrontational, so intimate, so full of sharp edges but as cozy and welcoming as Margot's little apartment. In their prologue, Markus&Markus make a mockery of death scenes from theatre, film and opera, from Romeo & Juliet ("O, happy dagger! "), to the final sorrow of Young Werther, to the character-slaughtering Game Of Thrones. Staging death will always be a parody because the actor always remains alive. Except in this case, of course, because Margot dies. We've all experienced death in our own ways, but it's a rare thing to become acquainted with and deeply fond of a complete stranger and then watch her die by her own hand, calmly and at peace, about two hours later. The play, through Margot, brings up a lot of difficult debate on the ethics of euthanasia and, at the same time, the ethics of documenting someone's process as she prepares for euthanasia. It unfolds as a sort of parallel to the death taking place on stage; it is as pre-meditated and careful as it is messy and painful. "Blonde" Markus, who has been popping pills at regular, calculated intervals, goes on to down an entire bottle of what I'm assuming is sparkling wine, then forcefully throws it up all over the stage floor. It's a horrible, stomach-churning moment, an allusion to the sheer force of will it takes to kill one's self. Whether you die in your sleep, of a terminal illness, by your own hand, or in a terrible accident – death, whether voluntary or involuntary, is hardly ever dignified. And all through the production I wondered, as I cried and cried: is Margot the exploited one, her final month laid bare in front of us, her confessions and her difficult medical history unveiled? Was it a "dignified" way to die, having us watch the exact moment she stops breathing? Or are we, the audience, the manipulated ones, prompted by the theatre-makers to follow a specific emotional arc, to argue, to cry? Markus&Markus have watched Margot die at least 45 times now, inverting what we assume to be the 'traditional' process of grief: we mourn, we have a funeral, we cremate or bury, we do our best to move on. But death never leaves us. The show presents other cultures of grieving that embrace this loss, whether it's exhuming the remains each year and bringing them home as if they were whole, and real, or allowing the body to decompose at home (the deceased is simply ill until he/she begins to rot). And I appreciated that candour the show brought to the most shadowy, uncertain of things. Everyone has their own convictions, religious, moral or otherwise, as to how their life's conclusion ought to be written. Ghosts made us sit with it, look it in the eye, hold its hand. For that, I am grateful. What happens when you allow someone to tell your story – but a version that's really their version of your story? And then to be complicit in that retelling of your story, of your own volition? Rabih Mroue's Riding On A Cloud, which opened The O.P.E.N. (heh) last week, is a gorgeous meditation on what it means to interpret histories – in this case both one's personal history, as well as the history of a nation. I've been struck, from what I've seen at The O.P.E.N. so far, by the ability of its films and performances to paint a very intimate portrait of a family or individual and simultaneously frame it within the larger painting of a country and its political, national struggles. We see this in Miguel Gomes' sprawling Arabian Nights trilogy, where tales of Portugal under economic austerity are told, sometimes in the most mundane moments of everyday living. And we see this in Jumana Manna's wonderful A Magical Substance Flows Into Me, an attempt at ethnomusicology that at once captures the very domestic daily lives of the diverse peoples occupying Palestine, as well as the larger, incredibly complex Arab-Israeli conflict. Riding On A Cloud takes us to Lebanon. But before that, it introduces us to Yasser Mroue, Rabih's younger brother and the main performer of the work. It is Yasser's story that Rabih tells – or should we say appropriates, in the most loving of ways – in an attempt to examine what it means to represent an individual on a stage, or a complex part of history to the world, while completely aware that every story that is told is simply one side of the story. Yasser makes his way to a small desk on the stage. We realise he walks with a pronounced limp. He eases himself into a chair. Before him: a tower of stacked CDs and a smaller deck of cassette tapes. He records himself speaking. Then with his left hand, he carefully opens a CD cover and pops the disc into a player. A video flickers onto a large screen behind him. He pops a cassette tape into another player, and we hear his voice (or is it Rabih's?). This is how the show goes. A video concludes, and Yasser goes on to the next one, backed by an audio narrative. It's a radio play-type unfolding of Yasser's story, from childhood to a crucial time in his life when he sustains a life-changing injury. In 1987, when he is 17, during the Lebanese civil war, Yasser is shot in the head by a sniper while crossing the street, distraught, after hearing news of his grandfather's assassination. He is saved by an operation but wakes from a coma to be told that he has aphasia. His speech, and his understanding of language, is severely impaired. Most notably of all, his doctors reveal that he has a cognitive problem with representation. The doctor shows him a pen. That's a pen, says Yasser. The doctor shows him a flashcard with a pen printed on it. Yasser can't recognise the object, even when it's placed next to the actual pen. To him, the flashcard is a piece of paper with some colours on it. I was inordinately moved by Yasser's journey of recovery. Perhaps it's because I write a great deal, and my currency is precision of language. "I suffer to find the right word," the voiceover says, at one point, after touching on the other twin love of my life, the theatre. He divulges that going to the theatre is a brutal, emotional experience in which he cannot distinguish acting from real life. To him, acting IS real life. The actors are real people. When they die on stage, they truly die. It's a truly epiphanic moment, sitting there watching him perform his own representation of himself, a representation he can distinguish cerebrally but not emotionally. This quiet unpacking of a single life manages to somehow always feel larger than itself, whether through Yasser's musings on how he was shot – better to be collateral damage or a predetermined target? – or when set against the backdrop of a country undergoing deep, fracturing turmoil. How much of this performance was invented, and how much of it was the truth? I'm not sure. But I do know that we convince ourselves of invented histories every day. The small lies, or half-truths, that help us pad out the traumas that we face, or allow us to take a less severe look at ourselves. How do we represent ourselves to ourselves? How do we backtrack, reconstruct our lives to make sense of what has happened to us? It is these things that make Riding On A Cloud at once devastating and life-affirming. I loved the small asides of wordplay that happen throughout the piece. There's a scene where we hear a song by the Civil Wars, a folksy duo (now defunct) that I love. The phrase "Civil Wars" on-screen then morphs into "Lebanese Civil Wars", and the melancholy ballad suddenly gains new meaning. It's a nod to the free association Yasser turns to when re-learning language, frustrated when he can't recognise the object on a flashcard and reeling off a series of unrelated objects in an attempt to find the correct answer.